This photo from last year’s Race Across America is one of my favorite cycling photos ever. Not only did I have to share it with all of you, I wanted to let you know more about the photographer, location, and rider pictured in it as well. In addition to all of that, I’m also going to give you a few details on the incredible “Cycling Landscape” Photo Contest we’ve got coming very soon. 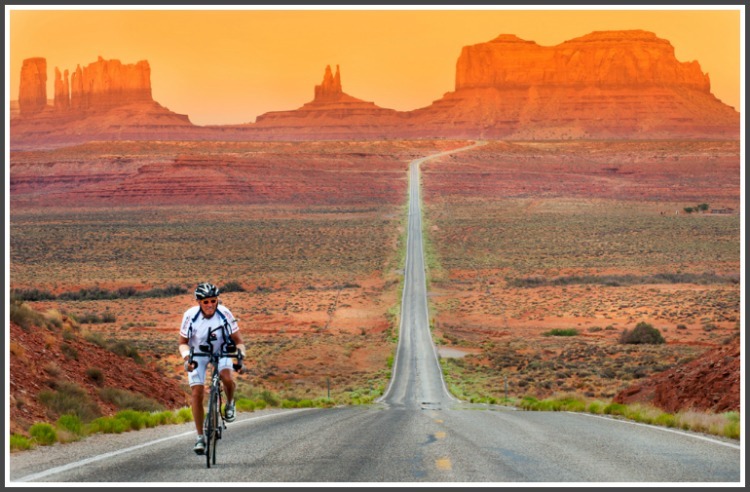 This is a classic image of RAAM–the solo rider climbing a long grade in the spectacular Monument Valley. Although there was almost no traffic in the area, there were two or three cars on the road in the far distance as Dex approached my lens–I had hoped to have a completely clear highway to emphasize the feeling of emptiness and space. The clone tool in Photoshop took care of the motor vehicle problem and turned the image into what I felt and saw when I was there. I also experimented with various versions of this image from B&W to different special effects as Dex was, at one time, considering the image for the cover of his book. Although Dan has spent the past 25 years of his life as a Cat 3 (and presently a Masters) bike racer, he doesn’t consider his photography to be focused on cycling. Generally his photos are of nature, landscapes, and streets. But when he crewed for his friend, Dex Tooke, in the 2011 Race Across America (RAAM) that all changed. During last year’s RAAM, Dan’s official job was taking a shift as one of the “Navigators” in the follow van, but whenever his hands were free, he was shooting photos of Dex and the scenery around him. Going coast to coast at 15mph is a great way to see the country! If you don’t know much about RAAM though, rest assured, it is most certainly the Mt. Everest of competitive ultra cycling. For these riders, the competition is much more an internal, psychological affair than a battle against one another. All, from the fastest to the slowest, deal with fatigue, saddle sores, hallucinations, sleep deprivation, wind, hail, heat, traffic, crew conflicts, navigation errors, mechanical issues and more in their 3000-mile crossing of America. If you get a chance to crew for a RAAM rider–DO IT! Last year, Dex Tooke was on his second attempt to tame the Beast that is RAAM. You could say he had some “unfinished business” (his slogan and the likely title of his upcoming book) because, in 2010, he was forced to withdraw just 180 miles short of the finish line in Annapolis. In 2011, he was successful, crossing the finish less than three hours before the time cut-off. By doing so, he became just the sixth rider over 60 years of age to complete the event. To put this in even greater perspective, ten times more people have climbed Mt. Everest than have successfully finished RAAM as a solo racer. We’re not going to unleash too many details right now, but if I were you I would go locate the greatest photo you’ve ever seen (or taken) that includes a cyclist and an amazing landscape backdrop. We’ll be back to give you more details for this contest on Friday. Can I purchase a print of this picture? I’ve got the perfect place on my wall and it will serve as inspiration for me to complete the RAAM one day myself. Hey Justin, yes you definitely can purchase a copy of the photo. We’ve had a few people write in asking the same thing. Send me a message at darryl@lovingthebike.com and I’ll let you know how you can purchase a print from Dan. Thanks for all the compliments about the image! After witnessing RAAM from the crew van I can only say that it is one incredible challenge and involves a whole lot of preparation–not just training on the bike. I’d highly recommend volunteering as a crew for a RAAM rider or team to get a taste of it before doing it yourself. I actually get choked up thinking about what these solo riders suffer in pursuit of their dreams. I’m not sure what the details are with the contest you mentioned, but I’d have to say that this one is the winner. I agree that it’s one of the best cycling pictures out there. If it was up to me, this photo would win the contest we have coming out tomorrow for sure. Be sure to tune in tomorrow for all the details and you’re definitely going to want to enter this one. That monument valley picture is so incredibly cool. I desperately want to do that RAAM ride with Pamela one time while we can still go reasonably fast. I hope things play out to make that possible…. What an awesome pic. Hey Eric, I would love to do the RAAM as well. I actually met a guy while in Bonaire who did the RAAM a few years ago….he’s from Dallas originally and has been living in Bonaire for the past 5 years. It seems like I’m meeting more and more people who have done it or plan on doing it. Maybe we can be like Dex and be one of the few people over 60 who have completed the RAAM. I really would like to try this one day before I die. Dip my tire in the West coast on the start and the East coast when I finish. I have a lot of cycling goals in my future. Darryl, the info you post is absolutely the BEST!!! Thanks Bethel, I really appreciate the positive feedback. Yeah, doing the RAAM would be amazing and anyone who does it has some incredible memories that last a lifetime. I live in Central California and we have a RAAM team going out this year to bring awarness to organ donations in honor of Crystals Dream one of our own who died last year during a cycling ride. It’s amazing whatching our team prepare for this ride, and now looking at this awesome picture reminds me of the beauty they will see as they ride across our country. Hi Sherrill, it’s so great that Crystals Dream team is taking part in this year’s RAAM. It is one amazing event and I wish them all the best.